I decided to watch some South Park, and a terrible Important Things with Demetri Martin. Then Daily Show came on. I watched it for a little bit. Then they showed a clip with President Obama. I'm not sure if this is from a news clip or Daily Show's parody clip. No biggie. Just a typo, I guess. I can't believe Jon Stewart didn't see it. Demetri Martin bit his entire schtick from Mitch Hedberg (who was really just a more stoned Steven Wright). I miss Mitch. I did giggle to some jokes. But it was a meh for me. Aaahh that explains it. Play of words. 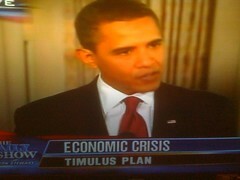 I just saw it in The Daily Show. I was just passing through.